The Walking Dead is a global phenomenon. It's currently the most watched show on cable TV, sending comic books sales of the source material through the roof and establishing its own spin off series less than five years after starting out. One of the key elements behind the show's success has to be the incredible attention to detail that goes into making-up the show's stars. Forget Rick Grimes, it's all about those walkers. Whether it's bicycle girl from the pilot episode, the well walker from Hershel's farm or Michonne's pets – everyone has their favourite walker. 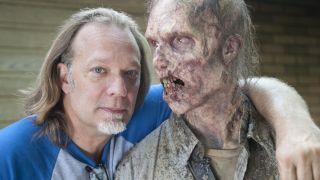 And the likelihood is Greg Nicotero had something to do with your favourite mound of rotting flesh. He's co-executive producer, special FX make-up designer and sometimes director on the series and is now producer on the new spin off series Fear The Walking Dead. With special effects credits ranging from Scream to Kill Bill, Day of the Dead to Deadwood, Inglorious Basterds to Breaking Bad – you name it, Nicotero has had something to do with it. We spoke with the effects mastermind before the premiere of Fear The Walking Dead to discuss the new series, its effect on the main show, and what he and his mate Quentin Tarantino have got up to in the meantime. Fear The Walking Dead is set at the start of the zombie apocalypse – does that pose a lot of new opportunities for the special effects team? It does. When we first started out on the original series we were about six to eight weeks into the zombie apocalypse so we were able to play up more decomposition. Here one of the things Dave Erickson and Robert Kirkman were very specific about was we wanted to make sure you had to look twice at some of these infected people to tell they had something wrong with them. That was kind of fun. It means we're not getting into a bunch of rotting flesh but we are taking advantage of the opportunity to see people struggle with the zombies and the exact result of stab wounds, gun shot wounds and things like that. The damage to the infected is much more immediate. What's your favourite example in the new series? In the first three episodes there are all examples of what I'm talking about. In episode one, the first walker we see, she turns around and there's a knife sticking out of her chest. That was something I pitched to Dave as it'd help sell this. Nick is having this hallucination but we were implying violence in and amongst what has happened in this moment. She was clearly attacking someone who'd stabbed her but they'd died in the attack so the knife stayed embedded in her chest. It's all those little nuances that help tell the story. It's something that's very important to me in any character or make up effect that I design – it has to tell part of the story. The nice thing is in episode two and episode three we have similar instances where the effect is not just done for the sake of a cool gag or gore. But it's done in service of the story. It goes to show and educate our characters what the world is now about. Has the introduction of 4K meant you have to make any changes to the effects? For sure. The amount of detail that you're able to see in digital versus film is exponential. The blend edges on the pores, the colouration of the make-up and prosthetics, all of that has to be much more precise. Even going from the pore texture on our performers compared to the pore texture on the prosthetics. You really see everything in 4K, the colours are much more vibrant. One of the reasons that we initially chose film for The Walking Dead was because we felt it gave a much more classic horror kind of feel. The grain of the film works to the benefit of what we wanted to tell. In Fear The Walking Dead we wanted a much crisper, cleaner look in that instance. There have been times when we've had to be cautious. When you're filming a close up of an infected person, they have contact lenses in and you have to be careful you're not seeing where they end. So we did a lot of different make up tests during our prep and photographed them. We looked at the colours of the blood and the way the make-up reacts to different lighting scenarios. These are all things that we still test when shooting on film but we had to learn our ground rules a little differently on the new series. For visual effects, shooting digitally helps and actually saves money as you don't have to digitise a negative. You can just use digital information to begin doing your CGI work. In that instance it gives us big savings in terms of money and time.